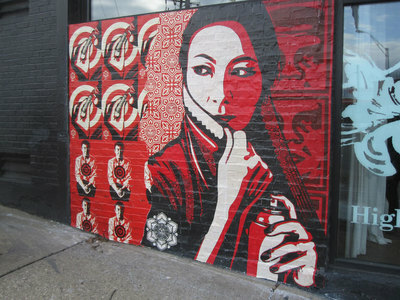 Images from Shepard Fairey’s Cincinnati visit posted on ObeyGiant.com. It’s great to hear that they’ll be back in May with new outdoor artwork. 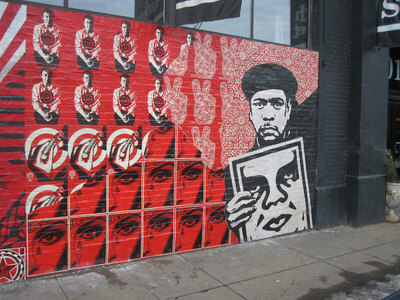 Here are some photos that I’ve taken of Shepard Fairey’s outdoor art installations with their locations in Cincinnati. I’ll update these as I photograph them. 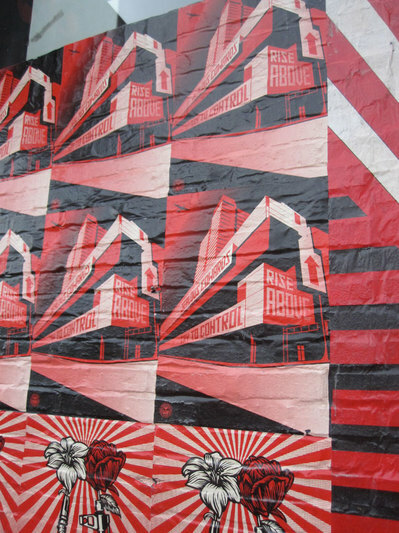 Shepard Fairey’s outdoor art installations are colleges created from a mix of small prints, patterns, and larger pieces. 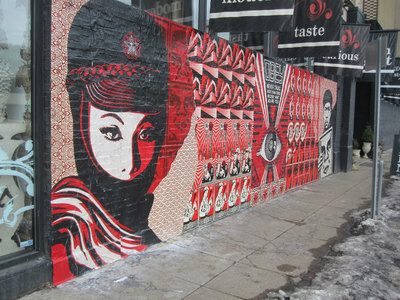 The prints are a on thinner paper called “pasters” that are glued to the wall using wheat paste. These art installations could last a year. The large image on the right is the Nubian Sign. The pattern behind the Nubian Sign is a Japanese Fabric Pattern like this Black on Red. The left of the pattern is Peace Fingers Red. 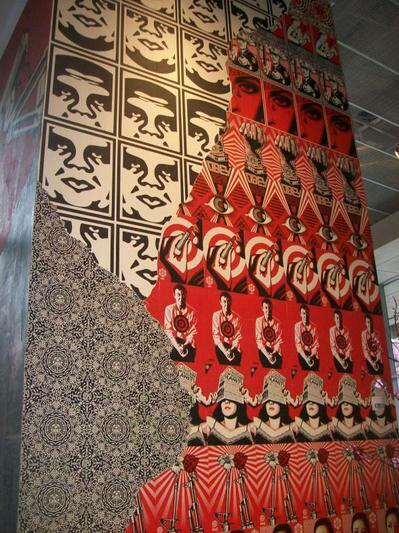 The large print is Obey Eye, smaller prints on the right from top to bottom: Jasper Johns, Kiss Me Deadly Red, Eye Alert Red The image on the left is one of my favorites, Mujer Fatal. The prints starting from the right, top to bottom are: Cincinnati CAC Print, M16 vs AK47, Rise Above Cop, and Stay Up Girl. Here’s a close up of the Cincinnati Contemporary Arts Center Print. Make sure you check around the corner in the alley for another of my favorites, Commanda. Deadly Red, Eye Alert Red, Peace Fingers Red, and Rise Above Fist. The image is Eye Alert Cream. Cop, Commanda, M16 vs AK47, and Mujer Fatal. Waiting in line to enter the CAC. The line was even longer when I left. This wall of prints is stunning. People just stare at this wall, mesmerized. War by Numbers was one of my favorite pieces at the show. 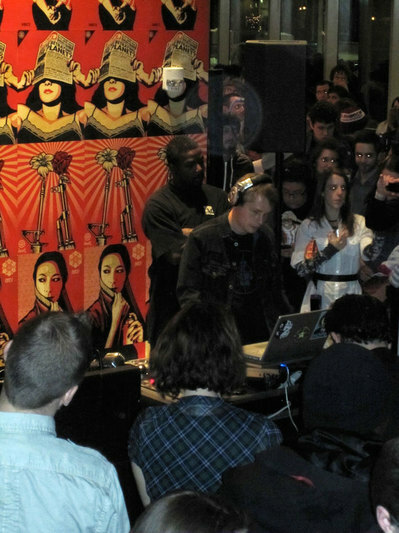 Shepard Fairey DJ’ing a set. Must have been a little weird for Fairey because most people weren’t dancing, just standing, watching, and taking pictures. 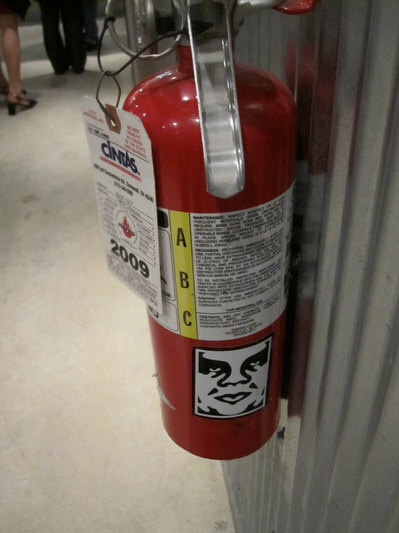 Someone tagged a fire extinguisher in the Chipotle on Fountain Square. 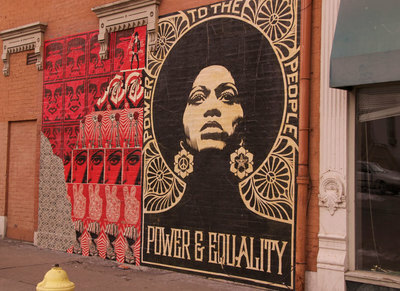 Shepard Fairey’s Supply and Demand Exhibition is here in Cincinnati! Opening Friday, February 19, 2010 and running through August 22 at the Cincinnati Contemporary Art Center. 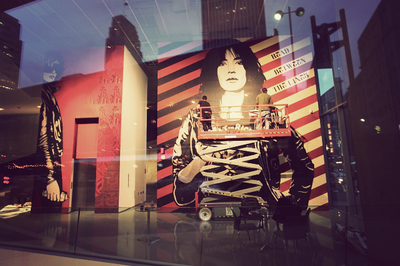 This is the third stop for this exhibition after the ICA in Boston and the Warhol Museum in Pittsburgh. 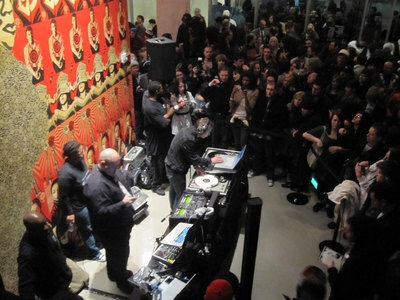 The opening party is tonight at 8:00 PM and features Shepard Fairey as a DJ for a set. 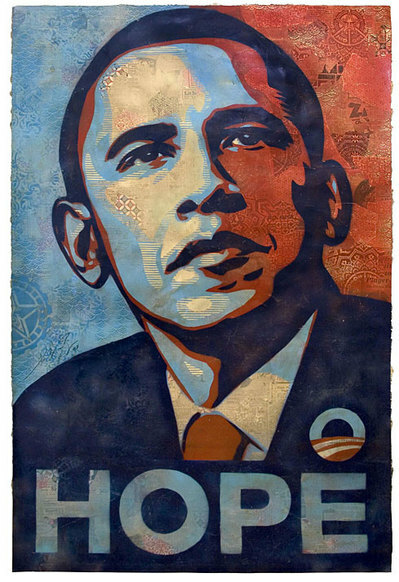 I’ve been a fan of Shepard Fairey ever since I saw the iconic Obama Hope image and have become quite a collector of his print works. Some of the highlights of the exhibition will be his large murals and his fine art collages. In addition to the ones at the CAC, there are several outdoor installations in the city. 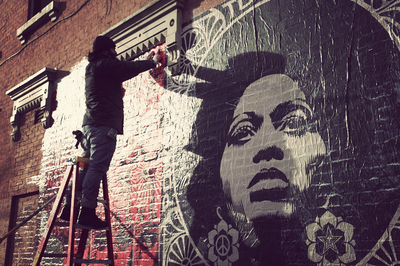 The Hope image below is one of his fine art pieces where Shepard Fairey creates a collage and then spray paints it using stencils. These pieces now cost thousands of dollars. Good thing there are the screened prints that have remained affordable at $40-50 dollars a piece with print runs of around 450 pieces. 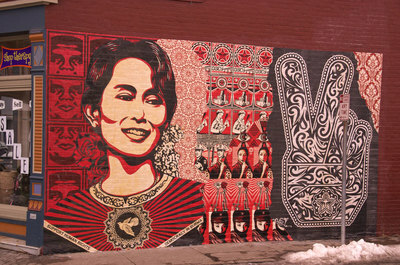 ObeyGiant.com– Shepard Fairey’s site. Buy his latest prints here. But, be quick, popular images usually will sell out within minutes of their release. 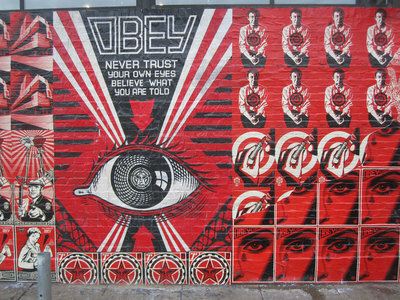 Check out the print archives for all of Shepard Fairey’s works. 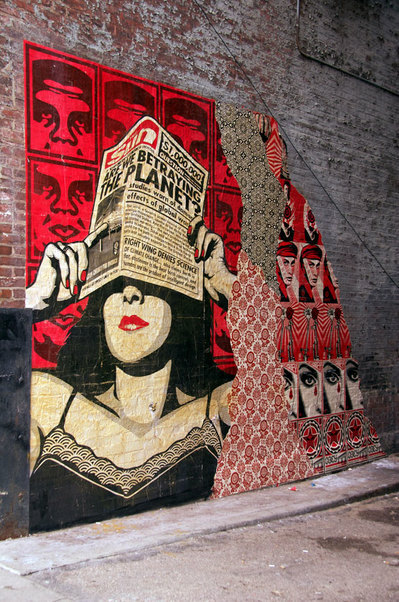 TheGiant.org– The forum is where I get all my Shepard Fairey news. You have to register to see the main forums. So many knowledgeable collectors congregate here. 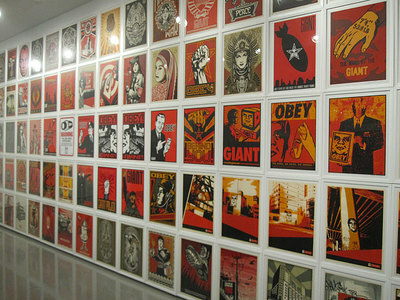 TheGiant.org also has an amazing print database of all of Shepard Fairey’s works. Expressobeans.com– Use this site to track the resale value of posters/print art. Great place to see how much your piece is worth on the aftermarket. 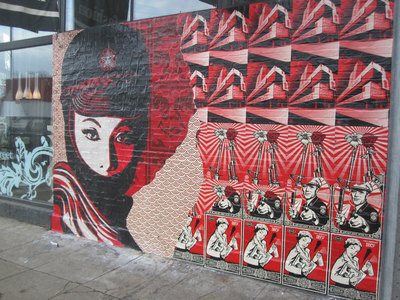 Duckywaddles.com– If prints sell out at ObeyGiant.com, sometimes a few “artist proofs” are released here. You can buy other older Obey prints here too. 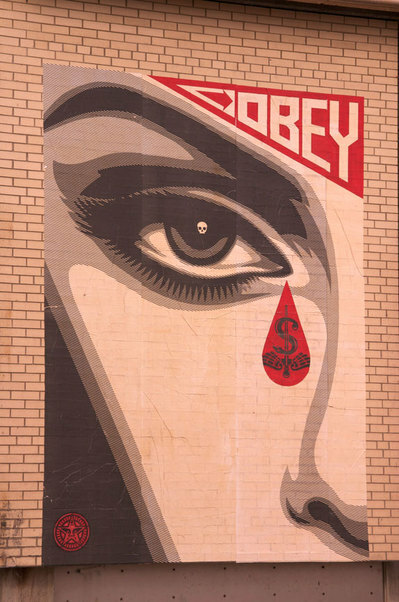 OBEY: Supply & Demand – The Art of Shepard Fairey – 20th Anniversary Edition – I highly recommend this book. 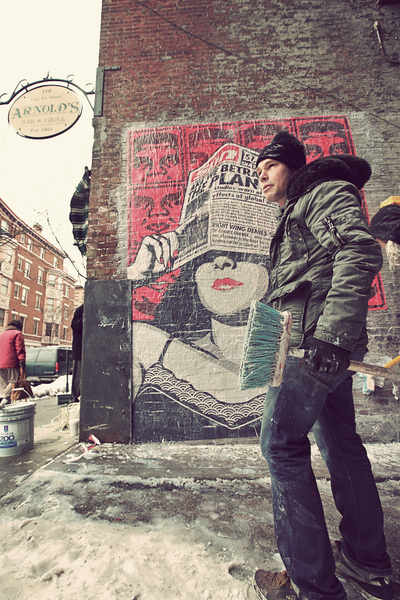 It’s a beautiful coffee table book the traces the history of Shepard Fairey. Lots of great pictures of his collages and fine art pieces. 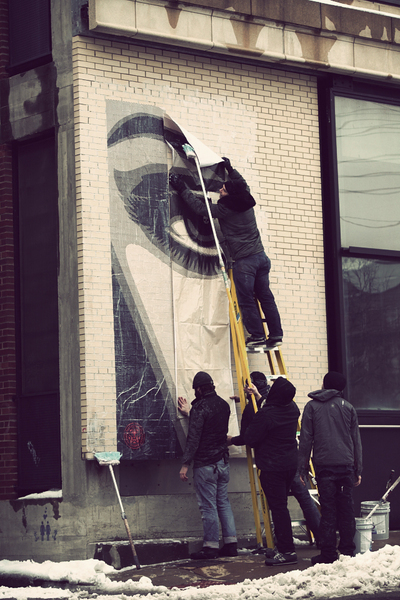 Shepard Fairey’s in town and art is starting to pop up! 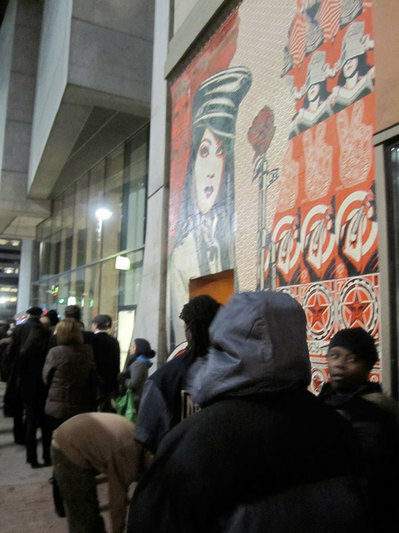 The grand opening of Shepard Fairey’s Supply and Demand Exhibition is Friday at the CAC. 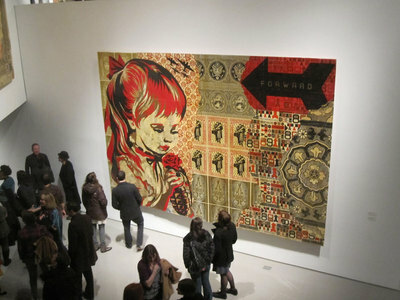 As part of his solo exhibition at the Contemporary Arts Center, Shepard Fairey created an illustration of the building itself. Signed and numbered, limited-edition prints of the illustration – just 450 will be made – will be for sale only at the CAC Store for $50 (profits will benefit the CAC). “I use the CAC building because it’s a beautifully designed building and it makes a specific connection to my show traveling to that museum, but I’m not using specific landmarks for the other pieces in the series,” he says. “The series deals with multiple themes and symbolic structures, including a bank and a factory. This is quite an honor for the CAC. 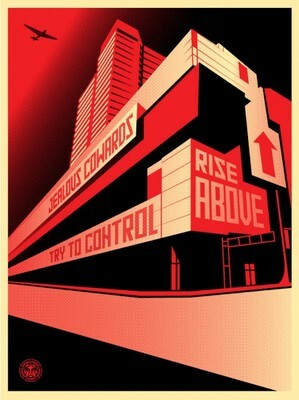 Off hand, I can only think of a few other Shepard Fairey prints that are of recognizable buildings. Clever video using lots of T-shirts to create a stop motion video. I wasn’t sure what to expect when I asked Jobs’ longtime rival, Bill Gates, what he thought of the iPad. After all, Gates has been a proponent of tablet computers for years, and he was in awe of the iPhone when it first came out. But the iPad? Gates told me he isn’t sold. Microsoft has tried and failed with the Tablet PC since 2001 which of course makes Bill Gates an expert in predicting the success of the iPad. The iPad like the iPhone will succeed because it breaks away from the conventional PC’s in a way that opens up new possibilities in computing. Mimicking old technology, just gets you more of the same. Microsoft has failed with the Tablet PC because of their inability to break away from its legacy items: Windows, keyboards, and the stylus. Even their new phone is called the “Windows” Phone. To me, Microsoft is one of the most disappointing companies around. All these years they should have pushing the envelope of computing and making products so great that they make us forget about Windows. Not because Windows is bad, but because Windows shouldn’t be the end all and be all of computing. They call these yachts? I barely recognize these as boats, more like something you see in Star Trek. 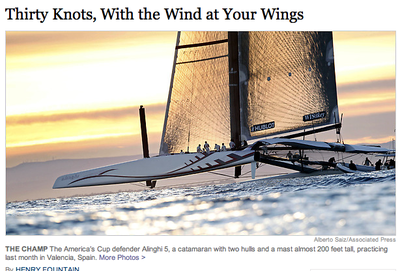 I love technology and the application of technological advances, but shouldn’t races be more about tactics than the boats? Despite the Colts’ 31-17 loss to the Saints in Super Bowl XLIV, they can feel good that their championship apparel will be put to good use. All of the clothes made in case the Colts were to win the Super Bowl will go to areas in need in earthquake-damaged Haiti. I think it would be a fun challenge to try to collect “championship” from every year.